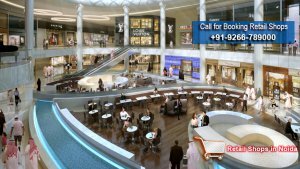 Gaur Sons the Asia’s top real estate company has brought a new commercial project for retail shops Gaur City Galleria. The wonderfully constructed project has been set over 125 acres huge mega land where very well designed Retail Shops have been made which are offering advanced and ahead of time features. The well crafted project has been placed at the prudently connected location in Noida Extension.